What I took away from this was it could not hurt in the least to have the goodness and proteins of my blood injected into my scalp. Dr. Greco asked me what my objectives were, you girls have seen my shaved head photos, I don’t think it is very realistic to expect I’m going to grow me some Rapunzel hair (darn). I said, I would like to keep what I have and hopefully have the texture improve and perhaps have some fill-in so that I could maintain a very short hair cut under my wig and not have to shave. He told me he thought my goals were very realistic. I may get this wrong but Dr. Greco said his dad (not 100%) was a doctor and had a patient walk in on a Wednesday who was sick and told the doctor to make him better by Sunday because he had a wedding to go to. The doctor’s reply: “how long have you been sick”? So as much as I want to see improvement instantly, the moral is patience. 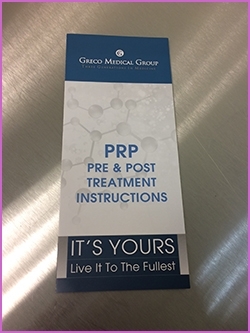 This is why I decided I will do more than one treatment to evaluate the personal benefits of PRP. I will say after 5 days my hair does actually feel less wiry and less dry. Dr. Greco says improvements are usually noticed after 4 months. I will take photos every month up until my next treatment, which I am planning to do in August (6 month mark). Quickly, here is what happened. After the blood was prepared, I sat in what looks like a dentist’s chair. Dr. Greco and his nurse wet my head with a spray bottle. Then they used a small tool that vibrated while they injected a topical numbing agent – the vibration tricks the mind to not notice your head is being injected. Pain level – please I’ve waxed my legs and that hurts way worse! After that another small tool is used and rubbed over the scalp in a back and forth motion to disturb the follicles with a little bit of pain (which you don’t feel because you are numb) forcing the follicles to go into a “wake-up heal” mode. Immediately after the blood is injected into your scalp and voila – finito. Total time – around 15 minutes. Hair wash next day, little tenderness for 2-3 days. I took zero pain meds.